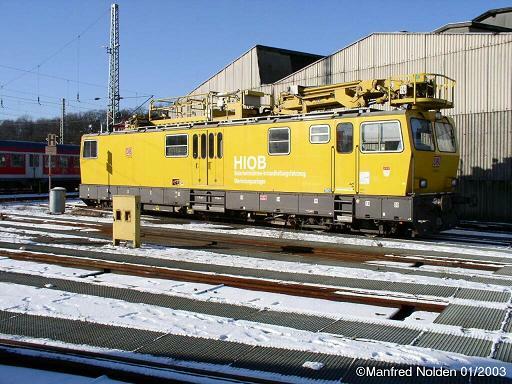 My big construction project for 2004 is to build a model of the HIOB, the BR 711 catenary mainetance vehicle of the DB AG. These pages document the design for the model, and will eventually include pictures of the finished model. This project was inspired by a contest Eisenbahn magazine ran in its July 2003 issue on the occasion of its 40th anniversary to see who could build the best HO gauge model of the HIOB. In support of this they provided nice photographs, drawings, and a paper cutout model in HO gauge. This inspired me to go one better in gauge 1. Drawings.zip contains 1/32 front, top, and side views of the HIOB. parts.zip includes all the flat parts of the model.